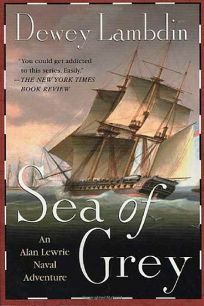 The tenth in the series of Alan Lewrie nautical adventures by Dewey Lambdin, Sea of Grey finds the swashbucklin', wisecrackin' 18th-century British naval officer who habitually drops his gs aiding the French in their attempts to suppress rebellion in the colony of Saint Domingue. Lewrie battles Toussaint L'Ouverture between trysts with a flock of breathless international beauties (""I have the basin... you wish me to sponge you? You are tres hot? I cool you?""). The lively pace and white-knuckle battle scenes should make this another winner with Lambdin's fans.